Sunday can’t get here fast enough. When the Philadelphia Eagles fly into AT&T Stadium on Sunday, they’ll be bringing with them two straight wins in the NFC East division that has them back in the thick of things to possibly win the crown once again. On the other side will be the suddenly hot Dallas Cowboys who are riding a 4-game winning streak, most notably a huge win over the New Orleans Saints. Eagles linebacker Kamu Grugier-Hill kicked things off this week by trash-talking the Cowboys franchise as a hold when he said they “always choke.” If his intent was to get under their skin, it didn’t work. “Who?” Prescott said Thursday when asked about Grugier-Hill, according to Zach Rosenblatt of NJ.com. 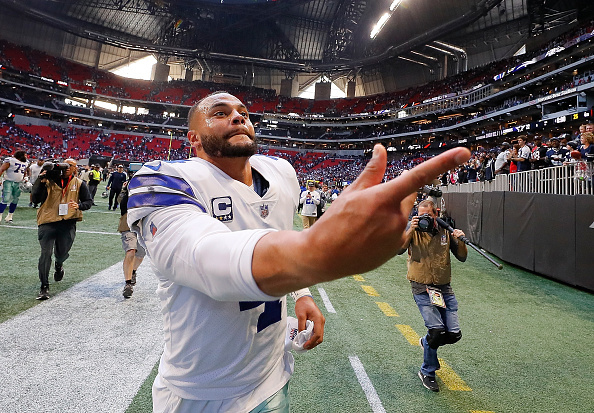 For all of the criticism he has taken this year, Prescott has been on fire, throwing four touchdowns and zero interceptions over the Cowboys’ four-game winning streak.